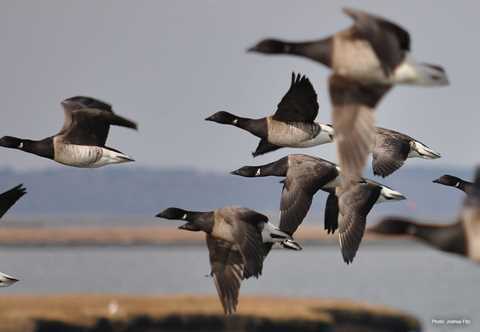 Brant often nest in loose colonies in Arctic North America and Russia. They breed on the coastal tundra, on low and barren terrain; on islands, deltas, lakes, and sandy areas among puddles and shallows and in vegetated uplands. To avoid predation, brant often build nests on small offshore islands, on islands in small ponds or on gravel spits. Parents are bonded for life and both tend to nests and young. Female brant lay an average of 5 eggs. Average length: M 25", F 23"
Average weight: M 3.4 lbs., F 3.1 lbs. In North America, two subspecies of brant are recognized, mostly due to differences in plumage characteristics. 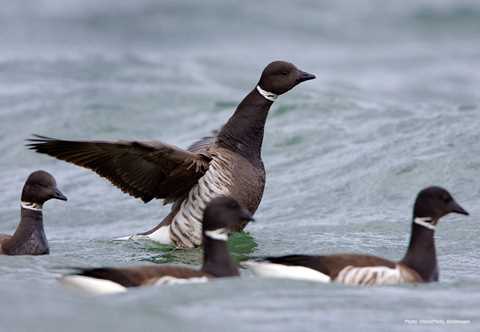 Atlantic or Pacific (black) brant are separated into subpopulations inhabiting distinct ranges and having genetic variation. 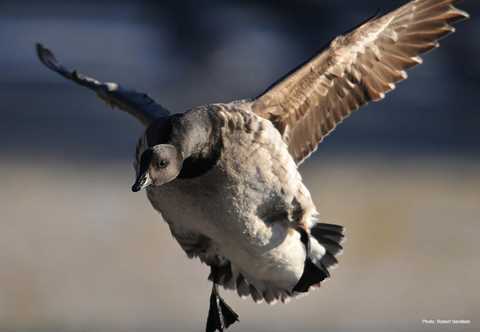 Brant are small, dark geese that have large wings, which give them their characteristic strong flight. Brant have short necks, small heads and bills. All subspecies have a black head, bill, breast, primaries, tail and legs. The otherwise black neck has a series of white striations, called a necklace, near the middle. The color of the belly varies according to subspecies and subpopulation. Both sexes are identical in plumage, except that the male's white necklace is larger than the female's. 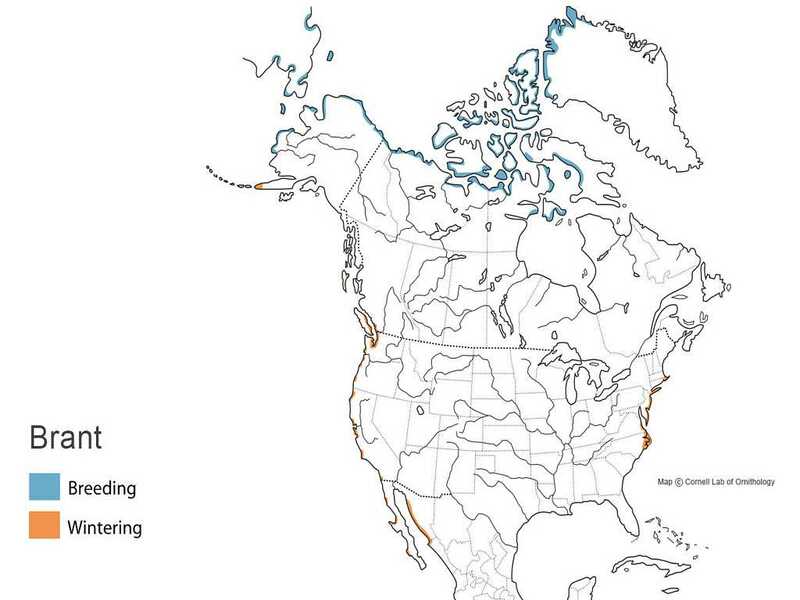 There are currently two populations of brant recognized in North America: Pacific and Atlantic. The Pacific (or black) brant have exhibited a significant downward trend from 1964 to 1992 and appear to be below historic population levels. 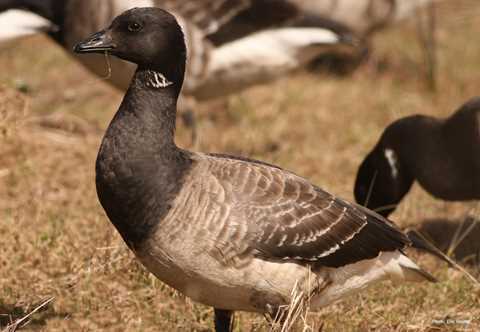 Brant are strongly dependent upon certain foods and thus the population is vulnerable to losses due to starvation and temporary breeding failure. In North America, brant winter along the Pacific coast from Alaska to Baja California and mainland Mexico, and along the Atlantic coast from Massachusetts to North Carolina (mainly from New Jersey to North Carolina). Since the mid-1960s, more than 80 percent of the counted winter population from Russia, Japan and North America has occurred in Baja California and other parts of northwest Mexico. Brant winter primarily in marine habitats that are marshy, along lagoons and estuaries and on shallow bays. Habitat use is often limited by the availability of eelgrass, a staple of the brant diet.